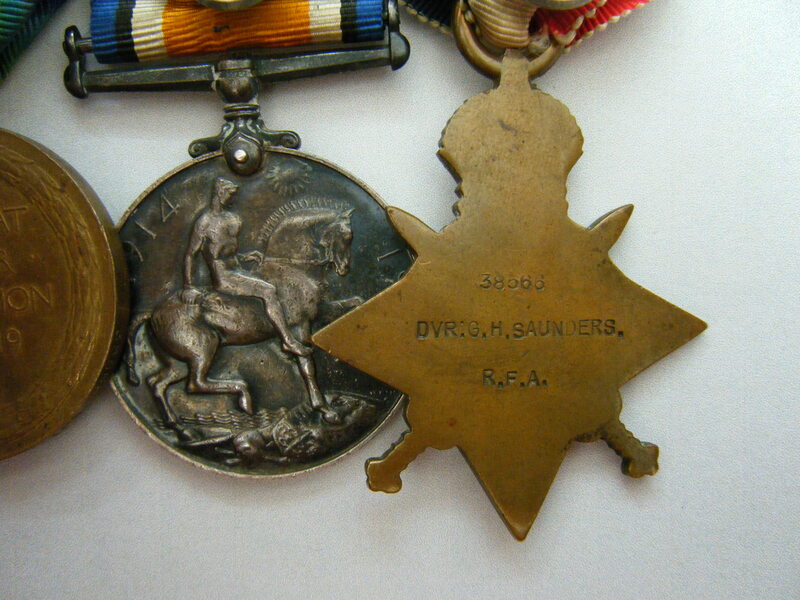 A 1914 Mons Star medal group awarded to 38566 Driver (later Sergeant) George H. Saunders, Royal Field Artillery. Saunders served with the 11th Brigade RFA and arrived in France on the 7th November 1914. 1914 Star (with Mons Clasp) named to 38566 DVR. G. H. SAUNDERS., R.F.A. 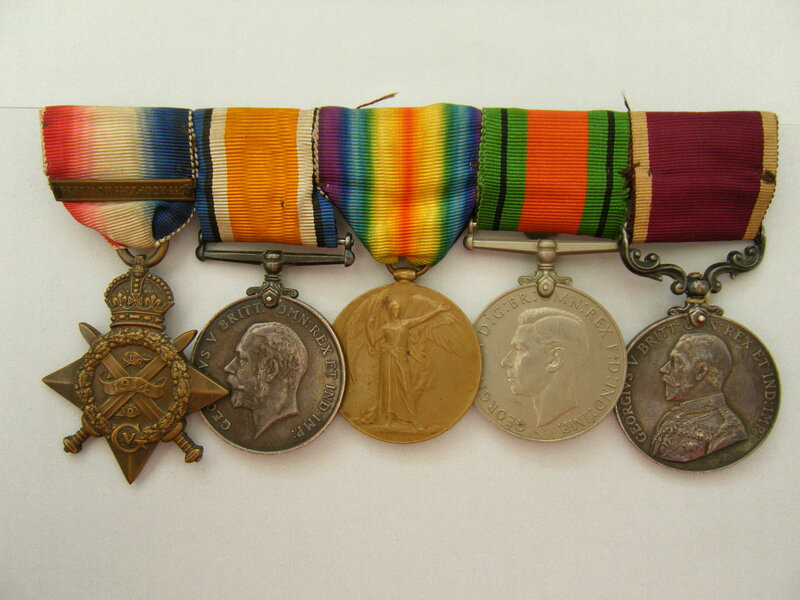 British War Medal and Victory Medal named to 38566 SJT. G. H. 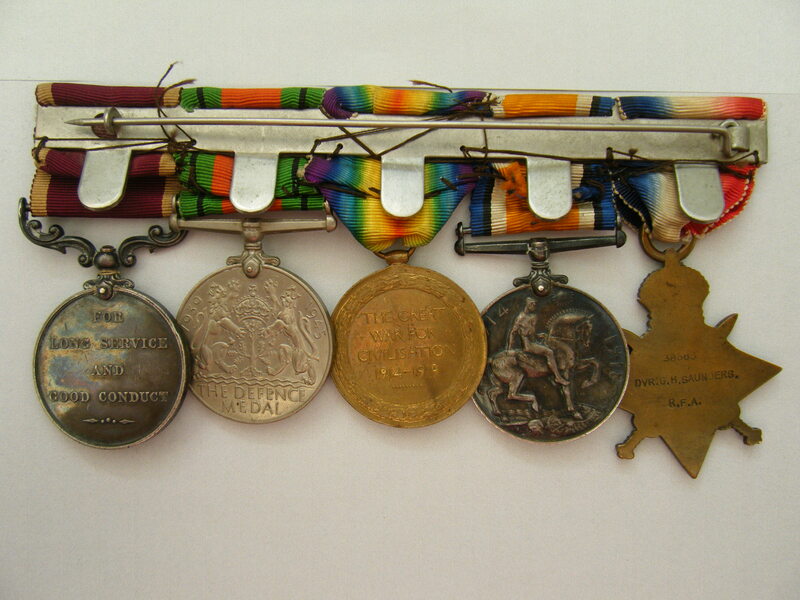 SAUNDERS., R.A.
Long Service and Good Conduct Medal named to 1022773 SJT. G. H. SAUNDERS., R.A. NOTE: the spelling of Serjeant is correct for the time. Included with this listing is a printed copy of the Medal Index Card (which also confirms the clasp and roses) which can also be viewed by clicking on here (if you have access to Ancestry). Also included is a studio photograph of Saunders in unirom. I have been unable to identify any service records relating to this man but given that he also has a defence medal, I assume he undertook some civil defence service during WW2. Prior to WW1, the 11th Brigade served with the 7th (Meerut) Division a part of the British Indian Army - this units history can be viewed by clicking on here. On the 22nd November the 11th Brigade had transferred to the 3rd (Lahore) Division. The Division existed before the declaration of war and was under the command of the Northern Army in India. It was responsible for posts and depots at Montgomery, Multan, Amritsar, Bakloh, Dalhousie, Dharmsala, Dagshai, Jutogh, Kasauli, Solon and Sabathu. It comprised a mixture of Indian and British units. The division was mobilised on the 8th August 1914 and sailed as part of the Indian Corps, leaving from Bombay and Karachi in the period 24-29th August. The first elements of the division arrived at Suez in Egypt on 8th September, and the division’s 9th (Sirhind) Brigade remained in the area while the rest continued to France. The main body arrived at Marseilles on the 26th September 1914 and moved northward by train. The Sirhind Brigade eventually also moved to France, landing at Marseilles on the 30th November 1914 - which is when it was joined by the 11th Brigade RFA. The Division took part in the following engagements; The Battle of La Bassee, the defence of Givenchy, the Battle of Neuve-Chapelle, the 2nd Battle of Ypres, the Battle of Aubers and the Battle of Festubert. With increasing difficulties of replacing Indian casualties, a decision was taken to withdraw the Division from France and move it to Mesopotamia where they remained for the rest of the war. HOWEVER, the divisional artillery remained in France when the 3rd (Lahore) Division left for Mesopotamia. V and XVIII Brigades (RFA) came under command of the 3rd Canadian Division 20 March - 13th July. They were joined by XI Brigade (RFA) and then came under 4th Canadian Division in July 1917. A full unit history can be viewed by clicking on here. This account gives a very detailed order of battle that numbers various RFA, RGA and RA units. Activities while associated with the 3rd Canadian Division can be viewed by clicking on here, while those associated with the 4th Canadian Division can be viewed by clicking on here. PRICE £295 - please read the terms and conditions below.